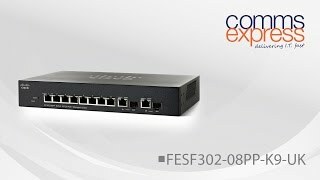 The sf302-08pp-k9-eu sf302-08pp 8-port 10 100 poe+ managed switch Networking & Wireles was added around December 2018. The best price for the SF302-08PP-K9-EU SF302-08PP 8-port 10 100 in Nigeria is ₦ 139538 sold at Senetic and available with free shipping and delivery within Delivery in 3-4 days. Product is also sold at Senetic for a price up to ₦ 139538.